Pilar Quinteros avails of her relationship to drawing as a starting point for developing actions that reconfigure public spaces and landscapes through interventions. The artist turns her attention to abandoned or destroyed places in order to promote restorations, reconstruction, replacement, or to intervene in the architectural elements of public buildings. She also looks to debris and ruins as elements of live content linked to the present. In the video Smoke Signals (2016), Quinteros recovers the story of the expedition led by Percy Harrison Fawcett in 1925 in search of a lost city that he called ‘Z’, supposedly located in Mato Grosso State, Brazil. 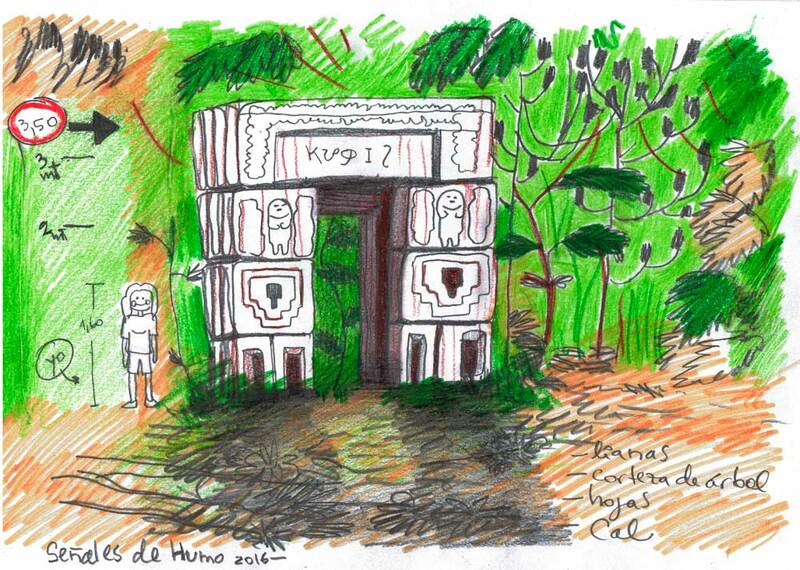 The artist revisits an imaginary that finds in Latin America fertile ground for the discovery of lost paradises and hidden civilizations, staging a search for the city’s remains and forging an encounter with its ruins. Quinteros questions historical accounts, memory, and the human ability of reinventing the past, emphasizing the fragile yet powerful nature of the narratives of expeditions like Fawcett’s by appropriating their shortcomings as creative possibilities.